In Group A, DR Congo played very strong in the third round where they won 4 games, scored 9 goals and earned 13 points in their group but were unable to qualify. Tunisia barely led the way in the group with 14 points and didn’t lose a single match. What’s more interesting is DR Congo had just as many points (13) as Egypt and Nigeria, who were both leaders in their groups. Nigeria was the leader of Group B with 13 points. However, they were handed a loss to Algeria as punishment for fielding a player who failed to serve a one-game ban. The loss didn’t matter and the closest team in their group was Zambia with 8 points. Victor Moses was the top scorer in the qualification round with 3 goals. Nigeria’s personnel staff is all Nigeria except for the German, Gernot Rohr who is the Technical Adviser/Head Coach for the team. He led the Nigeria team as the first African side to qualify for the 2018 World Cup with a 1-0 win over Zambia. Morocco had the most convincing victory in Group C with a 6-0 shut out over Mali. They had the fewest number of points out of all 5 group leaders that would qualify for the World Cup. They remained undefeated with 3 wins and 3 draws. Khalid Boutaïb was their top scorer in group with a total of 4 goals. This would be Morocco’s first World Cup qualification in 20 years so it meant a lot for the team to advance on. Senegal secured Group D and remain undefeated with 4 wins and 2 draws. They led their group with 14 points, the same amount as Tunisia in their group. Senegal unofficially lost a match to South Africa but FIFA ordered a replay of the game due to unlawful influence of the match by referee Joseph Lamptey. Senegal won the replay of the match 2-1. Diafra Sakho was the top scorer on the team in the qualification round with 2 goals. This would be the second time they qualified for the World Cup; their last appearance was in 2002. Finally in Group E, Egypt secured a spot in the World Cup by leading with 13 points. They suffered a loss where they were legitimately defeated by Uganda. They would qualify for the World Cup with a 2-1 win against Congo. Their top scorer Mohamed Salah was tied with Burkino Faso’s Préjuce Nakoulma with the most goals in the qualification round - 5 goals. This would be their third World Cup qualification and first appearance since 1990. We wish the best of luck to all the African teams participating in the 2018 FIFA World Cup. Hopefully one of the teams can make history and become the very first African team to become World Cup Champions! 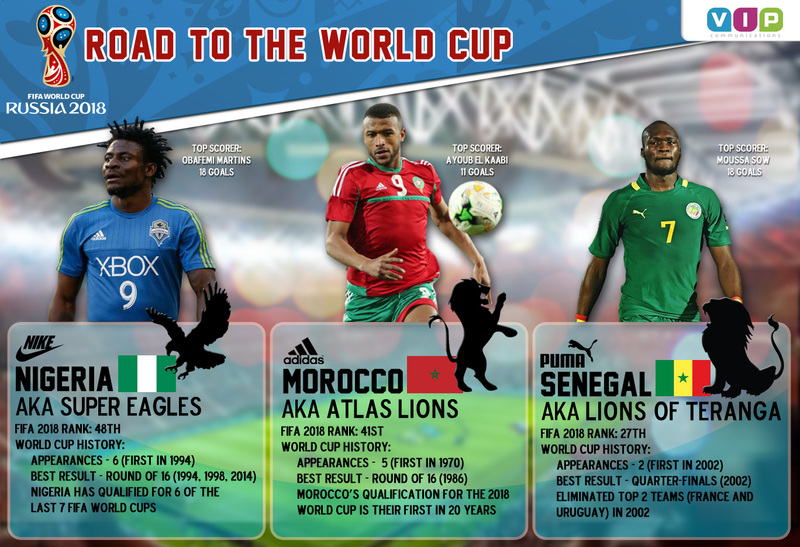 Here's some interesting facts about Nigeria, Morocco and Senegal. We are running 2 amazing promotions in celebration of the 2018 World Cup. Enjoy the games and happying calling! Get 10% off Mobile Recharge transactions throughout the World Cup from June 14, 2018 to July 15, 2018! Click here for more details! On each game day for Nigeria, Morocco and Senegal has matches, customers get 1¢ on the standard rate! Click here to view to full schedule to take advantage of this promotion!